As part of our celebration of Lakewood History Museum's 10th anniversary, we've published a 24-page collection of some of the most interesting articles from a decade's worth of our newsletter, the Prairie Gazette. The amusement park where doughboys from our local army base found a little "R & R" (rest and recreation) after drilling all day to fight the "Hun"--and what became of it. The local businessman who built the first modern shopping center west of the Mississippi--and made construction of Seattle's Space Needle possible. 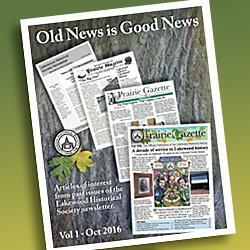 Copies of Old News is Good News are available for $5 at the Museum (6211 Mt. Tacoma Dr SW, in Lakewood Colonial Center, noon to 4 pm, Weds-Sat). Quite the bargain, considering how packed it is with information on local history, much of which is available nowhere else! BONUS: Become a member of Lakewood Historical Society and we'll throw in your copy FREE.